The general purpose of ventilation for a chemical storage building is to create and maintain a safe working environment where chemicals are stored, handled, and mixed. Ventilation is created through the recirculation of air by passive or mechanical means. Chemical building ventilation can provide a safe and protected work environment for all industries. Chemical storage buildings that have large quantities of chemicals or dense/high percentages of chemicals must have a proper mechanical ventilation system in place. Chemical building ventilation is very important to keep your chemical inventory maintained and controlled. Mechanical ventilation can also keep personnel, investments and your facility safe. 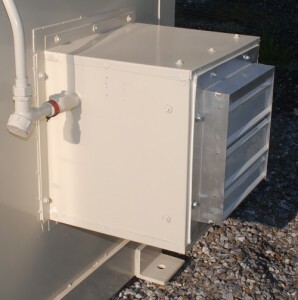 Chemical storage ventilation provides fresh air supply to your chemical storage building to protect your investments. U.S. Chemical Storage provides customizable chemical building ventilation systems for all your chemical storage needs. Our mechanical ventilation systems provide you with the safest and most secure chemical storage facility. Keep your chemical storage safe and maintained with a mechanical ventilation system from U.S. Chemical Storage. U.S. Chemical Storage offers explosion proof mechanical ventilation, non-explosion proof mechanical ventilation, passive ventilation, and heavy-duty, Group B, Explosion Proof, Mechanical Ventilation. Explosion Proof Mechanical Ventilation is weatherproof, FM Approved, UL & ULC Listed, Class A, B and C fire rated. Our Non-Explosion Proof Mechanical Ventilation System maintains a minimum of 6 air changes per hour, a light-duty vent for non-explosion proof purposes. Our Group B Explosion Proof Mechanical Vent is designed for Group B chemical usage. The motor of the Group B Explosion Proof Mechanical Vent is external to the chemical storage building.